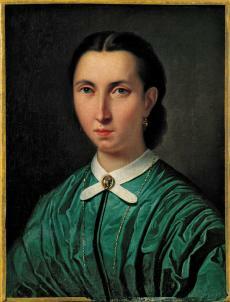 From the mid-19th century, portraiture was a popular genre in Modern Greek painting. Portraits – of scholars and members of the Court, captains and warriors, islanders and members of the new bourgeoisie – provide a panorama of a society that was evolving in the newly liberated Greece. Amongst the examples of early Greek portraiture in the A. G. Leventis Foundation Collection, special mention should be made of the small-scale, dark-toned oil painting Seated Noblewoman by Andreas Kriezis, an artist from the island of Hydra, as well as the Portrait of an Elderly Woman by Dionysios Kallivokas, with its evident Italian academic influence. Glowing, elaborate portraits produced by artists who pursued successful careers outside Greece reflect an idealised, refined beauty, with an emphasis on detail and a crystal-clear lucidity. Extraordinary examples of a harmonious visual purity are the Portrait of a Young Lady – a work of outstanding sensitivity and Neoclassical draughtsmanship – by Nikolaos Kounelakis, who studied in St Petersburg and eventually moved to Florence, and the Portrait of a Young Nobleman by Aristeidis Oikonomou, who was born and worked in Vienna. From the significant 19th-century works in the Collection, the Portrait of a Noblewoman from an Island by Tyrolean artist Francesco Pige displays his characteristic immediacy of expression and Neoclassical style, as well as striking details in the elaborate costume – featuring silk, embroidery, transparent lace – and ornamental objects (flowers, steles, reliefs), which unfold with a lightness of touch often with some landscape, archaeological monuments or island in the background. He and his family sought refuge from Turkish persecution in Odessa and later in St Petersburg, where he enrolled at the Academy of FineArts. In 1857 he travelled to Rome and Venice, where he familiarised himself with Renaissance art. He settled in Florence, where he worked successfully until 1867, as testified by his self-portrait in the Uffizi Gallery. Another work of his is in the Museo Civico in Padua. Ill with tuberculosis, he went to Egypt via Athens. In 1878, his mother-in-law, Euphemia Kampani, donated his works to the Athens School of FineArts Gallery. His painting comprised portraits, and biblical and mythological scenes, in which the influences of the Italian Renaissance and French Neoclassicism are evident.